Have you ever wondered what goes on inside a brain when it’s forming a thought? This video from a team of Japanese researchers shows neurons lighting up when they are active. This gives us a unique glimpse into a brain that is actively thinking. 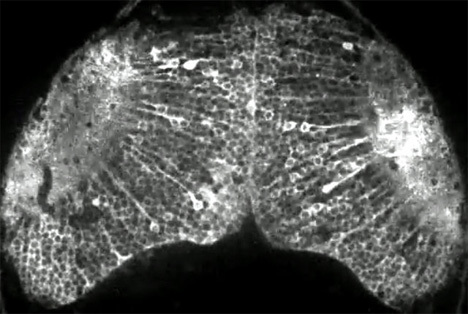 Alas, it isn’t a human brain – it’s the brain of a zebrafish. But the video represents a huge leap forward in understanding exactly how brains of all kinds function. The researchers made it happen with an extremely sensitive fluorescent probe that detects neuron activity. With the probe, neurons light up when they’re active and we’re able to see a thought running through this fish’s mind. In this video, the fish is watching its prey swim around so the thought probably has something to do with wanting to swim over and eat it. The researchers from Japan’s National Institute of Genetics are now working on using the same technique to depict thoughts forming in the brains of other animals. See more in Weird Science or under Science. February, 2013.